Last evening I went for a walk over to the other side of the river at Gualeguaychu in Entre Rios, Argentina. I was not intending to take any photos of birds, but happened to walk past this duck pond where there some birds that came close enough to get a shot on my point and shoot camera. 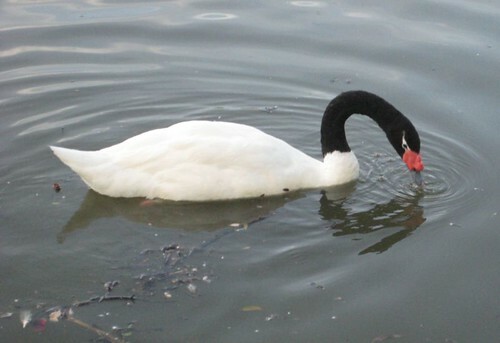 The Black-necked Swan is closely related to the Black Swan (Cygnus atratus) of Australasia. 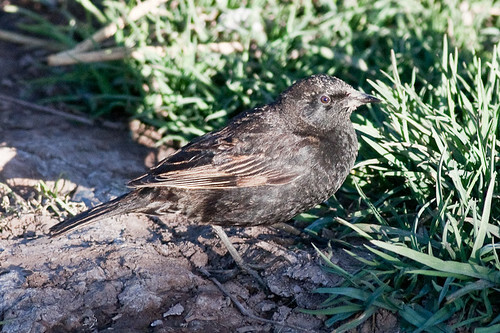 It is found in southern South America, in Chile and Argentina and is partly migratory with some birds wintering in Paraguay and southern Brazil. There were a few of these little ducks swimming around quite close to the shore, so I managed to get off a pretty dirty photo. I had a good look on Arthur Grossets website but I could not identify this one. Do you know what it is¿ I have a feeling that it might be some kind of hybrid/domestic variation. 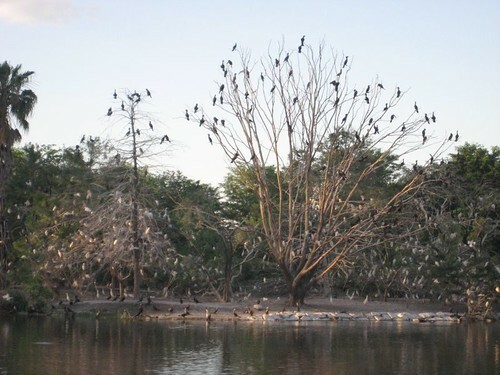 This tree was on an island in the middle of the pond and it was absolutely full of what looked like egrets and some kind of cormorant. I could not see close enough to tell what they were exactly. After the river adventures of Rosario I moved further into the Entre Rios region of Argentina. This area is called Mesopotamia because of the similarity to the area between the Euphrates and Tigris Rivers in Irag. I hopped on a bus from Rosario to Gualeguaychu which is close to the Rio Uruguay which is on the other side of the Entre Rios area. 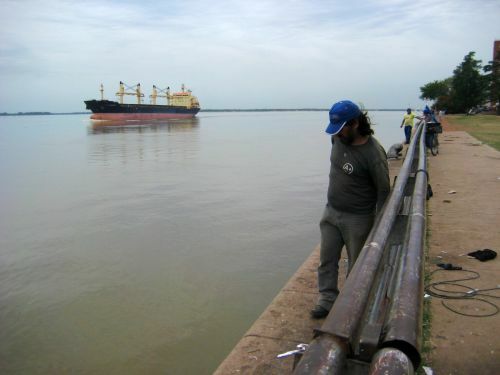 The Uruguay River serves as the border with Uruguay. 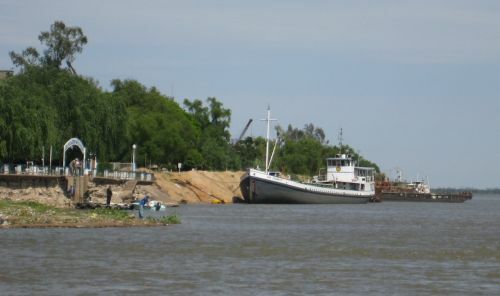 Gualeguaychu is actually on the Rio Gualeguaychu which flows into the Rio Uruguay. The next photo is from a river cruise that I took at Parana. People actually swim in these rivers. They are muddy and dirty. I went for a swim at Gualeguaychu yesterday and was not impressed. The water was filthy. yuk! But it was nice and cool at least. The weather here in Argentina is getting pretty hot, so a cool swim was welcome. I am hanging out here in the sticks because I do not want to go to Buenos Aires yet. I will probably head there after the weekend for a few days. Less than a week to go on my South American Adventures. Today I finally got to go on the river cruise on the Rio Parana at Rosario in Argentina. I had been waiting all week for it because it only operates on weekends and holidays. So today was the big day. I jumped on the 2:30pm cruise. There was another one at 5pm. This photo was taken on the way back down the river. This sailing boat is going against the current and seemed to be making a good rate of knots. It was weird to see hordes of people on a beach on a river, but I suppose when you live inland you take whatever swimming opportunities you can get. Beaches for me are things on the sides of oceans. 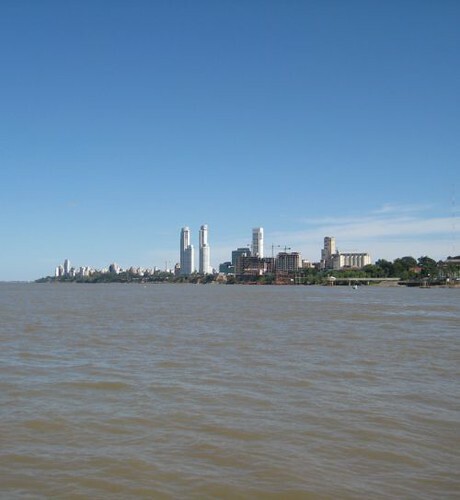 Here is the city skyline of Rosario from the river. It looks all elegant and modern. It is in some ways and not in others. Well, I am back in Argentina and it has been a long while since I made a post. It is a long story so here it goes. I got on the bus at La Paz and when we stopped for lunch half way to Cochabamba, my bag was missing with my camera and laptop in it. I had it above my seat. Some thief must have got on and lifted it while I was not looking. I told the cops but there was nothing they could do. They just told me to report it to the tourist police. It is gone, end of story. That is why I haven´t been posting any photos. All I have now is the point and shoot, so it is tourist shots from now on. After Cochabamba, I stopped at Villa Tunari for a few days. I went for a walk in the jungle over the other side of the river. It was so frustrating watching black headed kingfishers diving for fish and not being able to take any photos of them. drat. 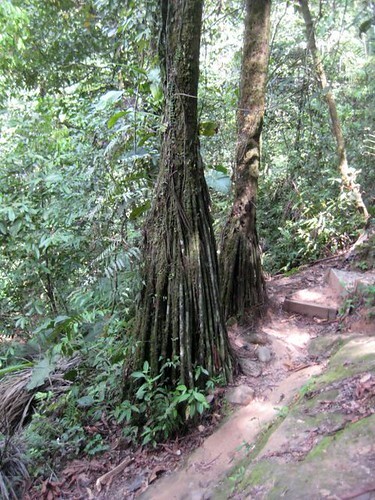 Aerial roots on some jungle trees. The jungle there reminded me heaps of Australian Rainforests. I was thinking that it may have been some sort of Gondwanaland thing. I have not looked that up yet. 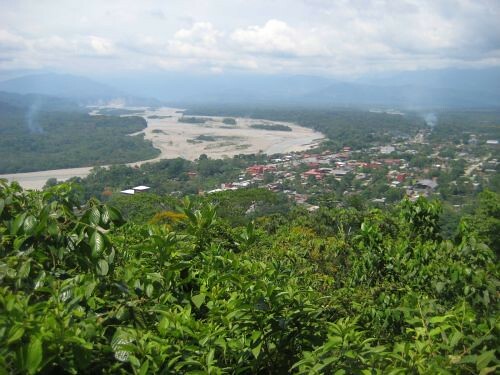 After Villa Tunari, I went to Santa Cruz, which is a big hot smoggy city just like all the rest of them. Then a long bus ride to the border of Argentina and down to Salta, Cordoba, and now I am at Rosario. Here is a photo of the river. They were catching heaps of catfish from the river and there were heaps of swallows just darting around over head. I could have got some great photos, doh! Last night I went down to the waterfront at Puno to see what birds I could find. I wandered off along the lake from the port area towards the south. There were lots of these Yellow-winged Blackbirds flying in and out of the reeds and feeding on the mud-flats before the lake. I could not find much evidence of their yellow patches on their wings. I am thinking it might be a breeding plumage thing. And here is the female. The female has quite a lot of streaking on the belly and front. 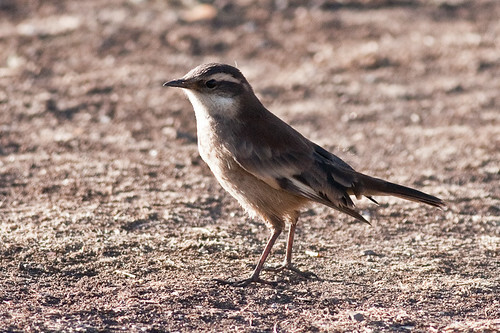 The other bird I saw on the mud-flats was the White-winged Cinclodes. 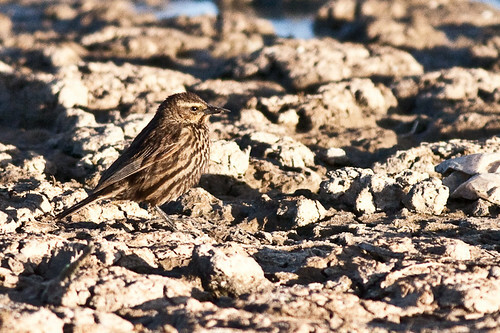 I had seen similar to this bird on the Bolivian side of the lake at Copacabana. 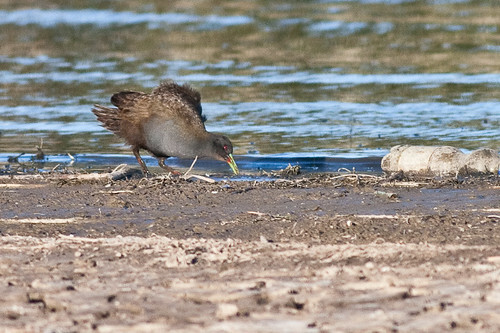 At first I thought this Plumbeous Rail was an Andean Moorhean, but the bill was too long and not stumpy enough. The Plumbeous Rail is distributed from Peru across to Brazil and down to Tierra del Fuego. They like marshes and ponds surrounded by dense vegetation. 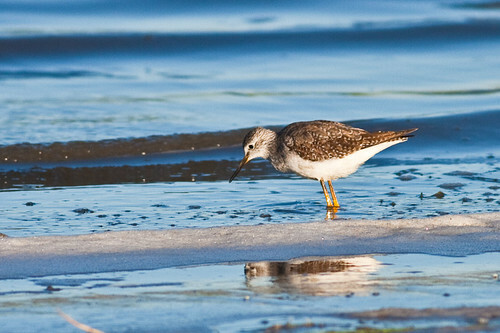 The Greater Yellowlegs breeds in the boreal forsts of Canada and Alaska and migrate to the USA and South America. They eat mainly insects and small fish. 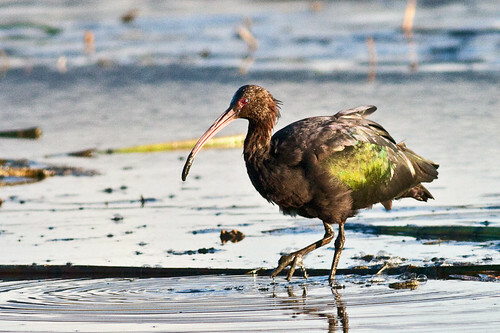 The Puna Ibis is a member of the Threskiornithidae family of Ibises. They are found in Argentina, Bolivia, Chile, and Peru. Its natural habitat is swamps. 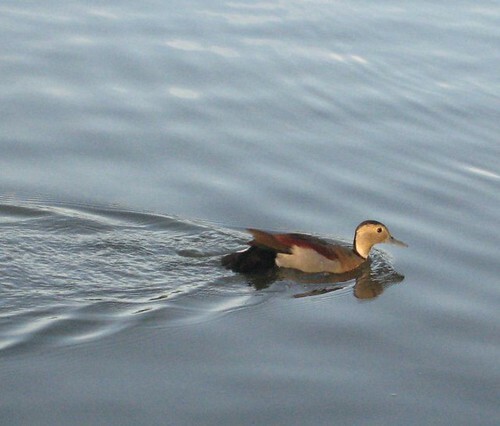 Other birds I saw were the Common Moorhen (Gallinula chloropus), Speckled Teal, Andean Gull and Puna Teal. I decided to fly to Puno from Lima because the costs would have worked out about the same and I would have saved about a week by not taking buses. The Tuesday flight was $150. I could have waited until Wednesday when the flight would have cost $100, but I wanted to get moving. I had to wake up at 3:45am and get a taxi to the airport. The taxi driver was half asleep as well and I apologised to him for making him get up so early. I checked in at Star Peru and then finally succeeded in buying a cappuccino and doughnut for breakfast. 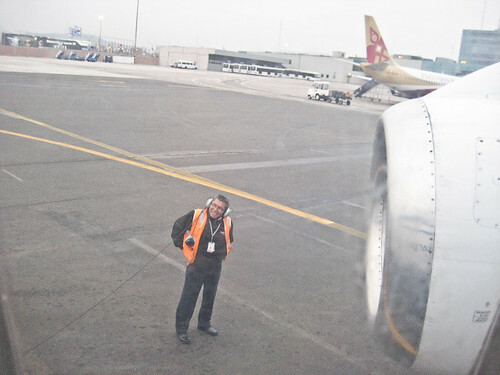 We boarded the plane and this guy helped us to back up the plane so we could take off. 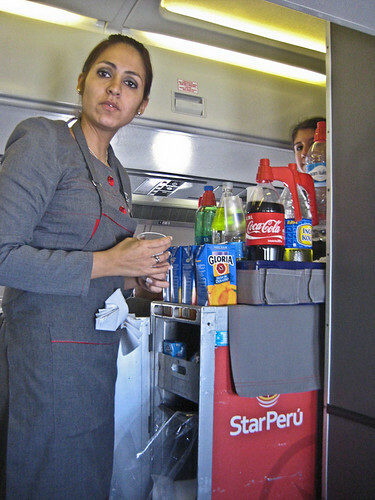 We even got a couple of biscuits on the flight and a cup of orange juice. When we approached the Andes, the mountains were like islands sticking out of the sea of clouds. 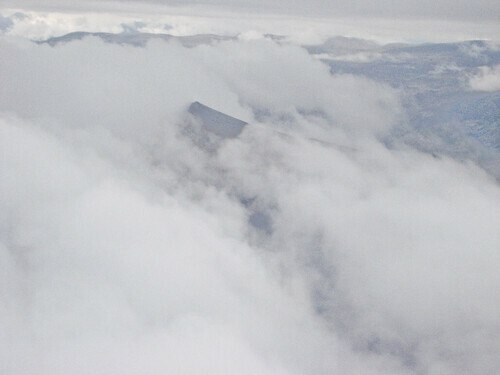 We were flying at about 8,000 meters and you could see the tops of the mountains, roads and some small villages. We soared into Cuzco and made a stop-off, then took off again for Juliaca. The whole flight only took about two hours all up. At Juliaca, I caught a shared taxi to Puno and am now staying at the Bothy Backpackers Hostel. And I have another bout of Altitude Sickness, so I am not impressed about that.